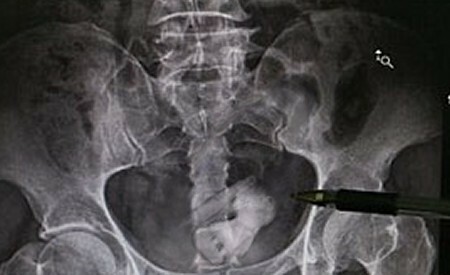 An unusual medical case was spotted in Japan (or China? ), where an X-ray scan result of someone’s body was found to be bearing a Nendoroid inside. Wait … what!? Yep, it is the X-ray scan result of the unfortunate folk’s womb/uterus. Let’s zoom-in the pic a bit. Nendoroid or Petit Hatsune Miku!? Is that Nendoroid (or Petit) Hatsune Miku inside!? (o.O”) How did it go inside there? Or the other way around, who knows? Seems so but I feel this way about Miku at this point. Can’t stand her anymore. You’re right! the Miku one is shopped, you can even see the outline of the bottle on the above image. It looks as if they have juts used the blur tool around it.